Flushing toilets using grey water requires some planning and a fair amount of commitment. Enchanting as it sounds, acquiring independence from the municipal water and sewage network is no straightforward task. There are a host of hoops and hurdles that need to be jumped through and crossed. Contrary to expectation, it is not all about budget. Sometimes space constraints are just too, well constraining. Water treatment takes up space. In volume, it is also heavy. These are very real challenges that require some thought and attention. Flushing toilets using grey water requires more than the flick of a switch. Is Flushing toilets using grey water an option? By way of example I will describe the process whereby we have managed to re-use treated grey water for toilet flushing. A quick parenthesis here. Sewage is the sum of black and grey water. Black water is waste water that has in some way participated in the food production or digestive processes. That would be dish washing and toilets. Grey water by contrast is waste water drained from cloths washing, baths, showers and basins. Returning to the grey water treatment example. Guiding principle number one is keep it simple. Guiding principle number two – minimize the use of pumps. In our application, we concentrate as much grey water use as possible in an upstairs bathroom. The hardly used Level 6b bath tub was removed and in it’s place we installed the family washing machine. The shower and basin were left untouched. Removing the bath was no easy task. A delightful cast iron tub is an unwieldy and heavy piece of gear. Storage is also an issue. I now have an ornamental bath tub in my bedroom. To get optimal use of the washing machine, a water splash proof plug socket had to be installed in the bathroom – challenge number two. This process involved drilling through a wall, installing conduit and a wiring connection point to a safe plug socket in the adjacent bedroom. Side note here. Electrical conduit is 20mm in diameter. To drill a suitably sized hole through a brick wall is a noisy and dusty affair. 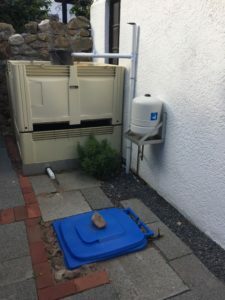 Once the electrical connection to the washing machine was in place, the cleaned water supply and drainage had to be plumbed in. There is a myriad of fittings required in this exercise and this takes time to plan and time to fetch from the nearest plumbing supply shop. So at this point the washing machine, shower and basin all drain to an underground sewer pipe. So far so good. Next step was linking the grey water drainage to a suitable grey water treatment plant. But one step back. The grey water line has to be isolated from the sewer line. Best practise is to install an isolation valve downstream of an equal T. The isolation valve is the get out of jail free option. Should the grey water system not work for any of many reasons, the grey water can assume it’s early route to sewer. This is the diversion node and should be installed at an accessible height. Accessible in that the grey water should flow freely to the treatment plant and accessible in that the isolation valve can be used in an emergency. In many instances the suitable position for the diversion node may not be very close to the grey water treatment plant. Some thought and attention is required to ensure that the grey water flows unimpeded to the treatment plant. Grey water contains a surprising amount of solid material – including a fair quantity of hair. It is therefore important to make sure that bends are kept to a minimum. It is always useful to include a few places where the line can be rodded. The challenge here is that the best route could, for example, cut right in front of a lounge window. This is what we had to deal with and the grey water pipe lost that battle. So our grey water line dips below surface for abit and then rises again. With clean, flushing water at hand we installed a submersible pump capable of delivering water at pressure. The advantage of such a pump is that it can be installed inside a tank, thereby minimizing exposure of pipes and fittings. Plumbing the treated water to the toilets presented its own set of challenges. It is tricky to work in confined spaces and sometimes it is not so obvious where existing pipes are hidden in tiled and plastered walls. Luckily for us, we discovered where the hot water pipe was. Unfortunately, we had to drill through same first to gather this bit of information. Lessons learnt by hard knocks. Treated grey water is now delivered to the toilets on demand. With a single flush, the water is used twice before being released from the property. This is a great accomplishment, rich in feelings of civic duty and environmental responsibility. However, not having to stand in a bucket in the shower is perhaps the greatest relief when collecting water for relief. Flushing toilets using grey water can be a viable exercise! The submersible pump is connected to a flow and pressure device. If the water pressure drops, when for instance the cistern handle is depressed, the pump turns on until the upper pressure is reached. Most cisterns are filled via a lever and float valve arrangement. As the water level increases in the cistern, the valve is progressively closed by the floating lever. At this point the pump is still working hard, but not doing much work. If the shut-off valve leaks, the pump will carry on running. Apart from potential burn-out, the pump can be heard on quiet nights and from nearby bedrooms. To prevent unnecessary pumping of very small flows, an accumulating tank was installed on the delivery line. This tank absorbs and releases water as the pressure drops. By so doing, the pump is spared the uncharitable task of running at low flow duties. The accumulator is another bit of kit that needs some space and plumbing. On the legal side, it is absolutely vital that no treated grey water is able to be discharged into the Municipal supply. If the treated grey water is used for toilet flushing, the ideal installation would be on a dedicated entry point to the cistern. In this way the treated water will not be able to access the Municipal water network. A belts and braces solution would be to additionally install a backflow preventing device on the Municipal potable incoming supply line. In summary it is worth noting that the rewards from flushing toilets using grey water are off-set by a cluster of multi-coloured pipes, equipment and cables. In times of water scarcity, the cost is worth every cent. In times of water abundance, it is a difficult decision. It is likely that future generations will marvel in the way we currently use perfectly good drinking water to flush toilets and irrigate gardens. Not so long ago, radioactive compounds were added to toothpaste. How quaint!